Ferns are vascular plants from the Pteridophyta division and have about 10,560 different species. They vary in sizes from 2 to 3 milometers tall to 10 to 25 meters in height. Depending on the type of species, ferns can live up to 100 years. Although they’re found all over the globe, they’re usually found in four particular habitats such as moist, shady forests, crevices in rock faces that face away from the sun, acid wetlands, and tropical trees. Ferns are among the oldest types of plants in the world. Fossil records trace back all the way to 360 million years ago during the late Devonian period. There are also fern species that only appeared roughly 145 million years ago in the early Cretaceous period. While ferns generally grow in tropical climates, with a little care and work you can easily grow one of these amazing plants in your home, which is a great way to add beauty and life to your space. It’s important to understand how to take care of a fern inside your home so that it will last for as long as possible and will be healthy, which is a problem that many people have when they decide to grow an indoor fern. These plants are actually very low maintenance, as long as you provide them with the right kind of care and provide them with the right environment. It’s important to remember that ferns will not do well when they are exposed to very low temperatures for a long period of time. You want to make sure that you keep your fern in an area of your home that is between 65-75 degrees Fahrenheit at all times. Additionally, since ferns like to have a little extra moisture when compared to other houseplants, keep them in a plastic pot instead of moving them to a clay pot, as this will help them to retain moisture. Do not place your fern in direct sunlight, as that can burn the plant, rather, keep them in indirect light so that they will still have enough energy to grow without being damaged. By pruning back damaged fronds, getting rid of pests right away, and fertilizing your fern during its active growing season, you can make sure that your fern has everything it needs to survive and thrive indoors. Ferns are a great way to add another layer to your garden and to soften up rough edges, but only if you are careful when taking care of the plant and provide it with the best possible conditions. While ferns may grow wild around your home in the woods, transplanting one to your garden or picking up a new fern from the store to line your path can result in it dying. Understanding how to care for ferns that you are growing outdoors will better your chances of these plants adding beauty and life to your yard. Even though ferns are incredibly forgiving and will generally be able to survive without a lot of care after they are established, they do take a little bit more work at first to ensure that they are going to grow as well as possible. Your first step is to choose the right fern for your space. Some are better at withstanding droughts than others, while there are some ferns that do a great job living in rocky or acidic soil without dying. When you choose the right fern for your growing conditions, you will have a head start on your plant is able to survive for as long as possible. Make sure that you mulch the fern regularly and water it during dry periods, especially if the fronds begin to droop or start to look a little dry. Additionally, in the spring, you will want to take time to divide ferns that have gotten too big, as this will prevent them from accidentally taking over your garden. There’s no reason why your winter garden should look dead and brown when the growing season for most of your plants has ended. By planting an evergreen fern in your space, you will still be able to enjoy something green throughout the winter. These ferns will not die back to the ground or die completely, which means that you will be able to enjoy the way that they look throughout the winter. When you look for an evergreen fern that will be able to withstand droughts and snow without dying, it’s important that you choose one that can easily live in your area. Unlike evergreen ferns, deciduous ferns are going to lose their green every single year. The plant will store chlorophyll, which will ensure that in the spring it will be able to produce fresh new growth. The dormant period that these plants experience in the winter allows them to store up enough energy to be able to survive the active growing period. While deciduous ferns won’t stay green and provide that lovely contrast in your garden all winter long, they are still a great option for anyone looking for a gorgeous plant to use in their space. These ferns will not only lose their green and die back in the late fall and winter, but they also will die completely down to the ground. They do not have any permanent woody structure that provides the shape of the fern throughout the winter. One problem that some people have when they plant herbaceous ferns in their garden is remembering where they are, as they will die back completely to the roots. It’s important that you mark where your fern is so that in the spring when it is time to start planting in your garden you will not accidentally dig it up or plant a new plant on top of it. These ferns fall somewhere between deciduous and evergreen ferns in terms of how they grow. Some semi-evergreen ferns will shed their foliage, but only for a very short time and they don’t experience the long dormant period that deciduous ferns do. Another reason why ferns may be labeled as semi-evergreen is that they lost the majority of their foliage, but not all of it, for part of the year. Finally, ferns may have this label because they will lose some of their foliage due to certain weather conditions, such as a cold snap, aren’t evergreen in very cold environments, or they will lose their foliage due to certain insects. This is one of the most popular ferns to be used as a houseplant and is commonly seen on front porches in the late spring through the early fall. While it’s not hard to take care of these plants, they do require specific care or the fronds will start dying back and the plant will not look healthy. It’s important that your Boston fern is in a cool location in your home and has plenty of indirect light and humidity for it to be able to thrive. During the winter, you will want to make sure that you take steps to keep your fern as humid as possible, or it simply won’t be able to survive the dry air of your home. Lightly misting the fern a few times a week or setting it on a tray of pebbles with water will help to provide the moisture and humidity that this plant needs to thrive. It looks great in a hanging basket due to the long fronds that will reach down. This is a very distinct looking fern, and while it can be grown for some time in a pot as a houseplant, due to how quickly the fern grows, you will soon need to consider how you are going to transplant it. Many people opt to mount their staghorn fern on a board and keep it secured there. By hanging the plant on the wall in this way, you won’t have to worry about it outgrowing its pot or how you are going to provide the care that it needs. These ferns will rot quickly when watered excessively, which is why mounting them is such a great idea. When mounted, you can plunge the entire board and plant into the water to allow it to get damp and then allow the plant to dry out completely before being watered again. Being mounted on a board also makes it very easy to spray the plant with water and provide it the high humidity it needs to survive. Holly ferns can be grown indoors, but because they do so well in dark areas of your garden, they are often used outside in landscaping and gardens. Because the plant doesn’t need as much sunlight as other ferns, you can easily grow it inside without worrying about stunting its growth or causing it any damage. These ferns can reach two feet tall and will spread about three feet wide. They make a great plant to add interest to the back of your garden or they can be grown in the shade of your porch without any problems. If you live in an area with mild winters, then you may be able to leave this fern outside in the cold, but if your temperatures drop too low, then you need to bring it indoors so that it can survive. 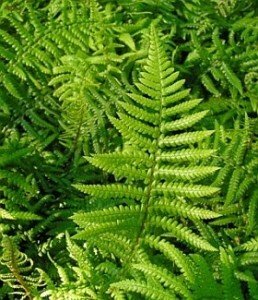 These ferns have very attractive feathery-like fronds that are soft and will add charm to your landscape or your home. 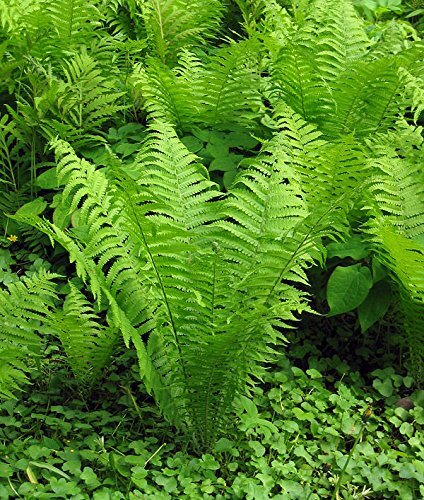 They will thrive in wooden and moist areas of your garden, making them an ideal fern to plant if you want to improve the appearance of your shade garden. Not only can they be grown on their own or in a container for extra impact, but they also make the great ground cover when you plant a number of maidenhair ferns close to each other in the same location. When growing a maidenhair fern as a houseplant, it is important to remember that they do not like being repotted and prefer to be in smaller containers. Make sure that you do not place your maidenhair fern near vents in your home, as they can cause the plant to dry out and suffer. These taller ferns can easily reach higher than four feet in height and have two distinct types of fronds, making it fairly easy to tell this fern apart from others in your garden. The large, green fronds around the outside of the plant are sterile, while the cinnamon-colored fronds that grow from the middle of the plant are fertile and plume-like. Together, the two fronds will give the plant a multidimensional feel that will set it apart from other ferns that you may have growing in your garden. Make sure that you plant your new cinnamon ferns after your last expected frost so that the cold doesn’t kill them. They can be planted close together in the garden to form a backdrop for other flowers or they will help to improve the appearance of swampy areas in your yard when planted a few feet apart from each other for the most possible impact. This fern may not, at first glance, even look like a fern, since the fronds are not airy and feathery, but rather thicker and look much more like elongated leaves than fronds. The center of this fern looks like a bird’s nest, which is where the plant got its name. The fronds have a crinkled or wrinkly appearance and may resemble seaweed. In the wild, bird’s nest ferns are epiphytic and will grow attached to other things, such as a building or a tree. Because of this, while you can grow this type of fern in a pot, they love to be mounted, much the same way that a staghorn fern does. If you grow your bird’s nest fern in more light, then it will have crinkled fronds, while ones that don’t get as much light will have fronds that are flattened. Of course, as with any fern, an overabundance of light will cause your fern to yellow and can eventually kill the entire plant. While this type of fern can technically be grown as a houseplant, in the wild they can grow up to 40 feet tall. They have large fronds that can be anywhere from four feet to twenty feet long, depending on whether or not the plant is located outside. The fern will not change colors in the fall, and there aren’t any fruit or flowers on this type of fern. If you do decide to plant this fern in your garden, then you need to make sure that you provide it with weekly watering, especially during dry weather, which can quickly kill your new fern. Because the fern can survive in shade to full sun conditions, it is a great choice if you are looking for a standout fern. This plant doesn’t like fast changes in its growing conditions, including the temperature, sunlight, or humidity. Normally displayed in a hanging basket on the porch in the summer and brought inside to improve the appearance and air quality of a home during the winter, the asparagus fern will provide the best foliage growth when it is placed in a shady spot. While rare, sometimes the fern will flower and produce very small white flowers that are attractive. The asparagus fern may appear very fuzzy and soft, but it actually has small thorny spurs on the fronds, making it a good idea to always wear gloves when you are tending to your fern so that you do not injure yourself. When the asparagus fern is happy and healthy, it will produce small red berries that can be planted to easily propagate the plant. As a houseplant, the asparagus fern can be tricky to take care of and will need daily misting to prevent the fern from turning brown and dying. If you have an area in your garden where you have problems growing plants due to the amount of shade, then it’s time to try an ostrich fern. These ferns are a great way to create a stunning backdrop for other plants in your garden and grow up to six feet tall when well established and cared for. Because this plant grows in large clumps and produces very tall and arching fronds, it is reminiscent of an ostrich’s tail features, from which it gets its name. There will be smaller fronds that will grow in your fern, which are the fertile fronds. They will remain standing even after the taller fronds have all died back for the winter. While this plant can be grown inside, it is difficult to provide it with the humidity that it needs to thrive, but homeowners love that they can harvest fiddleheads from the fern for their meals as a special treat. These colorful ferns are a far cry from the typical green that most people think of when they picture a fern, which is one reason why so many people want to have them in their yards. The fronds are silvery and have a bit of blue on them along with red stems. There are a few different cultivars of this type of fern, and they will all vary in appearance, although they have similar growing needs. Japanese painted ferns love getting morning sun and need a very rich soil to grow well. If you try to plant your fern in less than ideal soil, then you will need to make sure that you fertilize it regularly to keep the plant growing the best that it can. It’s a good idea to amend the soil with compost before even attempting to plant a Japanese painted fern so that the plant will have the best chance of thriving. Royal ferns are very large and have interesting leaves on the fronds. They are resistant to deer and rabbits, which makes them great to plant in your garden if you have problems with animals eating your plants. Make sure that there is enough room for the plant to reach its full size, which can be up to six feet tall with a three-foot spread. If the plant is cramped, then it will not be as healthy as possible, nor will it be able to grow to its full potential. Make sure that you take time in the fall to prune back any fronds that are browning and keep the soil moist, especially during the dry season or in the summer when the fern may be susceptible to hot temperatures and dry ground. This is an easy houseplant to grow because it handles low light incredibly well and is very difficult to overwater. The dusky green of the leaves combined with their interesting design makes this plant one to consider. The fronds are not at all delicate and the leaves are wide enough to hold their shape. Because this fern doesn’t get much higher than one foot tall or wide, you never have to worry about it taking over your home. Make sure that you use potting soil that will drain quickly so that the roots of the plant aren’t constantly damp. This type of fern is a very popular houseplant and is enjoyed so much partially because of the interesting shape of the leaves and the way that the fronds hang and move. They are clump-forming ferns that have wiry threadlike stalks growing from rhizomes in the soil. Because of this, they do look a little similar to palm trees to me, even though there isn’t a main stem on the plant. While they do require high humidity like all other ferns grown indoors, they are significantly easier to take care of than some other fern options. Regular pruning is important to keep the plant looking healthy and to ensure that there is enough new growth each year. By cutting the fronds close to the bottom when needed, it’s easy to control these ferns.